An ink-stained finger jabs at a well-worn key. The key slaps a lever forward to kiss a soft black ribbon. The ribbon kisses the paper, leaving behind the dark impression of a letter. Another finger jabs, and another and another. Letter follows word follows phrase and before you know it, a page is full of words, a swift hand yanks the paper free with a flourish and another is quickly scrolled in, more words smacking into existence. The fingers are attached to hands, which are connected to arms, which reach forth from a man. The man is only barely aware of the keys, his fingers moving from memory; no, rather he is focused with, eyes burning with the desire to see what his thoughts sing on the page. He is consumed, obsessed, in love with this moment, this fiery alchemy that transforms love and hate and fear and tears and sound and image into something as comically placid as the printed word. The man is in love with writing, with words, with poetry and the lyrical fluidity of his Illinois-born American English. Somehow he has acquired a compulsion–to read whatever books crossed his path, to write the wild adventures he’s imagined in the green fields and on whitewashed porches. He has not moved from his seat for hours, a seeming sloth, but in his mind he is racing, jumping, flying, a-quiver with the thought of what’s coming next. He vibrates at the sound of the slap-slapping of keys. He is alight with a rocket’s glare, summer fireworks, glittering sun on warm waves and soft skin. He writes because it is what he does, what he is, and he cannot imagine not doing it. He is Ray. 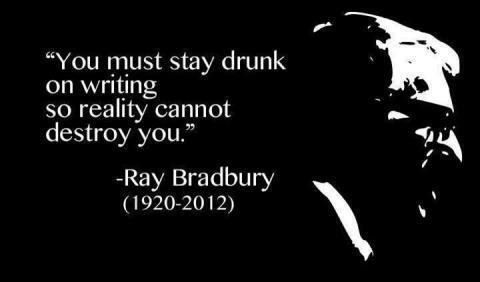 Bradbury by birth, a writer by trade, inclination, destiny, and the grace of God. Ray is gone, and though I never met him I will miss him greatly. I’ll keep trying, Ray. I owe you that much. This entry was posted in fiction writing, personal, philosophy. Bookmark the permalink. good on you Bart, great tribute to a worthy – wonderful artisan.